The BusyAdvice service gives the caller multiple choices when the person he is calling not is available. Version 2 also gives possibility to personal messages (promts) and personal DTMF choices for the users. Users without any special personal settings use the standard settings. The BusyAdvice service also works when a call is transferred from an IVR or a waiting queue. The call can be transferred to the BusyAdvice XML script and a SIP message is sent to a specific agent and/or an E-mail is sent to an E-mail address. Ex group mail or personal mailbox. If the call is from abroad (prefix 000), English voice prompts are used. There's both an English ‎ YouTube video (ENG) and a Norwegian YouTube video (NO) demonstrating the service. Download the XML script to PC and extract the file. It content both English version and Norwegian version. For other language, only record new promt files and translate the messages in the txt files. agent_ext.txt - Extension number for phone message when call transferred from waiting queue. message_WQ.txt - Message sent when call transferred from waiting queue. Example: "No idle agents in your waiting queue, please call me back ". Remember, only one sentence, no line feeds, one space after last letter..
message_User.txt - Message sent when call forwarded from an user. Example: "You were busy, please call me back ". Remember, only one sentence, no line feeds, one space after last letter. message_Subject.txt - Subject in message sent by E-mail. Example: "Call back to ". Remember, only one sentence, no line feeds, one space after last letter. server.txt - outgoing mail server, ip address or domain. Example: "192.168.0.250" for an internal Exchange server, or "smtp.demo.com" for an external server. If use of domain, remember setting of DNS server on the PBX. If the E-mail server require log on name and password, you have to edit inside the XML script. Use Notepad for editing these settings. You can also edit the E-mail sender name inside the XML. Default name is "innovaphone PBX"
DTMF_choice.gxx - "The person you are calling is not available. Press 1 to be called back, press 2 to leave a message, press 3 to be transferred to the operator, press star to be transferred....press hash....."
voice_response.gxx - "Thank you. We will call you back." Create a VM object in the PBX which points to the BusyAdvice_PRO xml script. For example: "BusyAdvice" pointing to "http://127.0.0.1/DRIVE/CF0/BusyAdvice/BusyAdvice_PRO.xml "
Create an User object in the PBX with name "VM_rederect", no number, enable "hide from LDAP". The xml script uses this object to redirect calls to the voicemail. For each transferred call, the xml script will edit the Call Forward setting for this user object. If this object already is created for use in other xml scripts, it is OK.
Set Call Forward CFB to BusyAdvice VM object you have created. Of course, you can also set other types of call forwarding depended on the messages you have recorded in the promts. If you want a call back message sent by E-mail, also set the users E-mail address in the URL field. 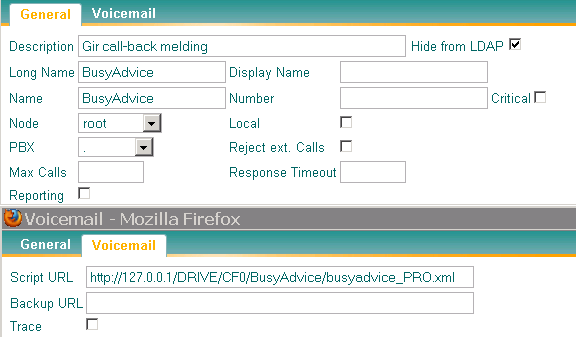 To use the BusyAdvice script in a waiting queue, set a IVR choice pointing to the script name. In version 2 of this XML, the XML cheks for personal voice promts and personal DTMF choices for choise <3>, <star> and <hash>. If it exist a personal folder with personal promts or DTMF choices, these are used. If it doesn't exist, standard promts and DTMF choices are used. http://download.innovaphone.com/ice/wiki-src#advonbusy - download the complete file package of scripts and files described in this article. This page was last modified 09:58, 28 August 2017.